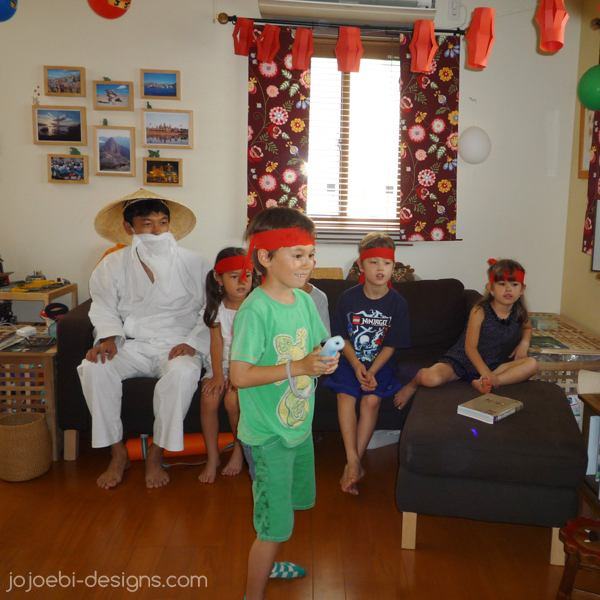 We started off with Kai's katana (sword) training. 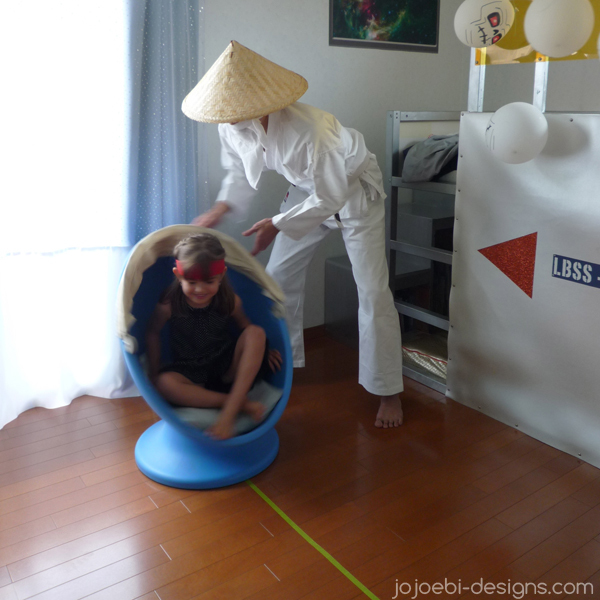 For this we used a wii game, from wii sport resort, where you have to chop various items in half. We did this as training and not competitive games because we had a mixed age and ability group of kids, so I was aiming just for fun. 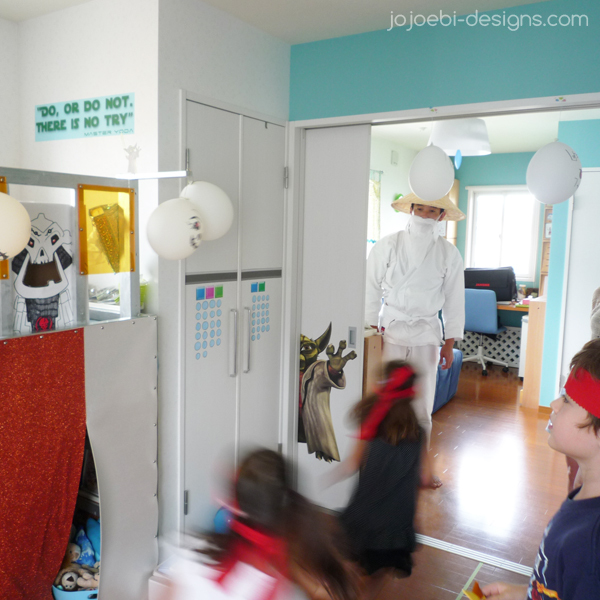 Oh yes, and the fella in the white is Sensei Wu - he is the Ninjago master. Next was Zanes's target practice. Ebi-kun had made everyone 3 shuriken (ninja throwing stars) and I made a skeleton target, with his mouth open, you had to get the shuriken in his mouth, throw one run through and join the end of the line for your next turn, it was a fast moving game! 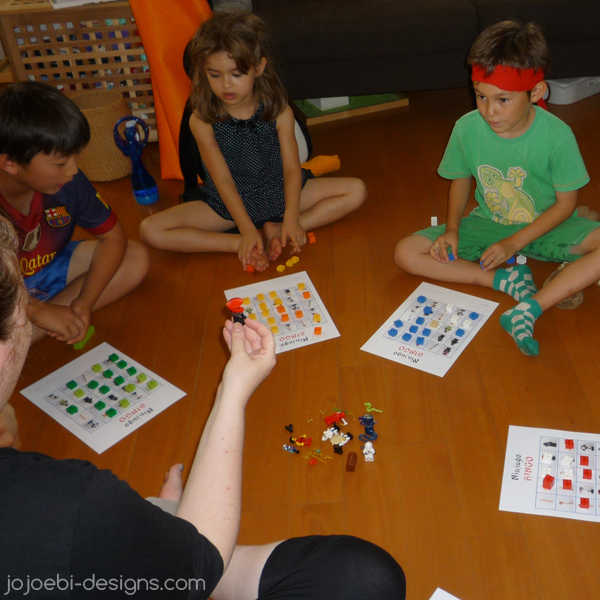 I used my teacher training and made sure we had a BIG game followed by a small game - big is for big movement, loud, get the wriggles out kind of game then to bring the level back down you slip in a quiet game. This keeps the day at a good energy level without kids getting over excited. I forgot to take a photo of Cole's Rock training, it was basically guess how many pieces of Lego are in the jar. 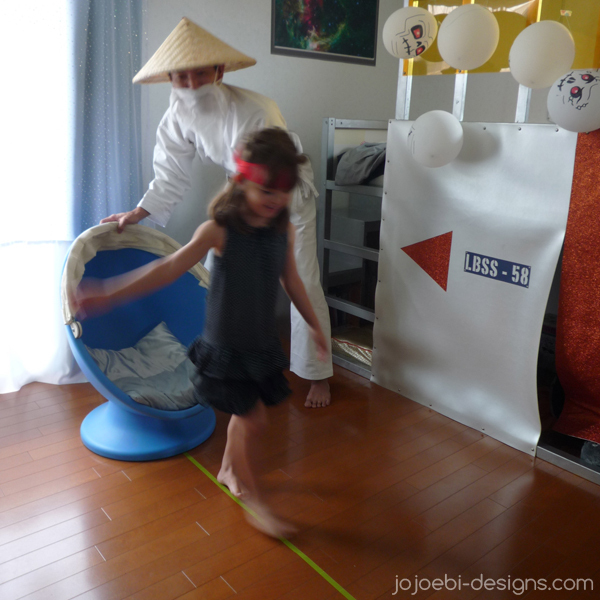 Then we had another BIG game, Jay's Spinjitsu Training, for this the training ninja sat in the spinning chair, Sensei Wu span the chair round 10 times and then the ninja had to walk down the line without falling off - rather amusing! The next training was a stroke of genius on my behalf, Sensei Wu's Zen Training. We got the kids to sit cross legged and meditate for 5 minutes to calm them down before lunch! 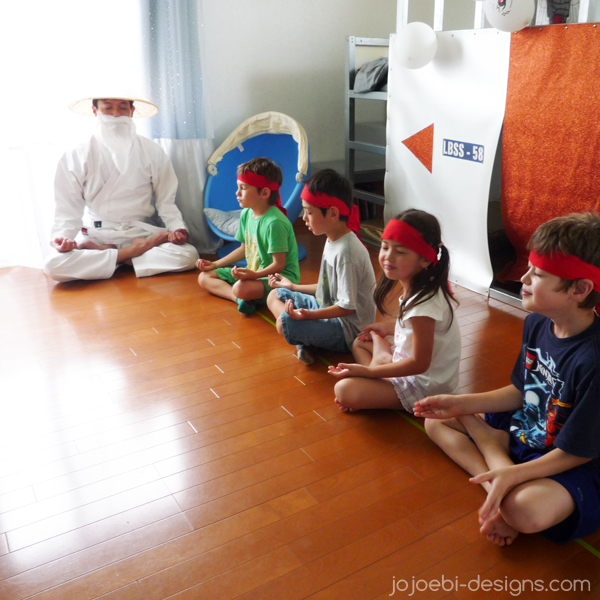 I can't imagine many kids go to a party and have to do meditation, worked a treat though. After lunch we had a few rounds of bingo then the kids had free play and the parents had a good old gossip! 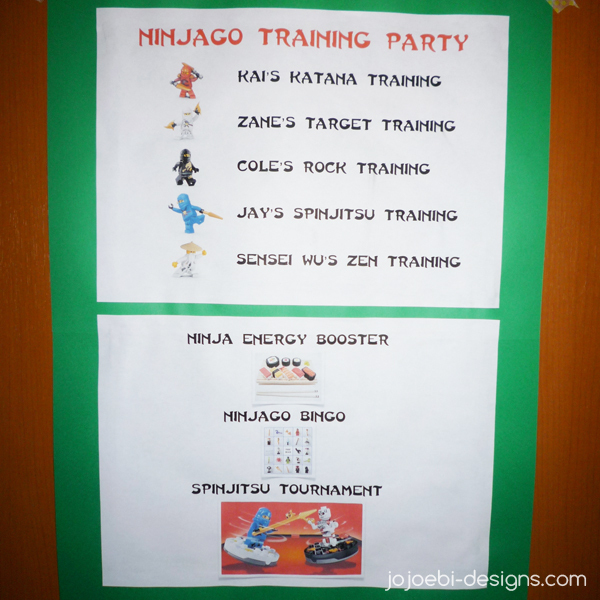 For the bingo, I took photos of 30 Ninjago pieces, then set up a grid in Pages. dropped each piece into the grid at random, repeated with the next page. I was going to share the file but I am not sure of the legalities. We usually have a big party in the park but the weather has been all over the place this year so we decided on a small one at home instead, just as well since we had a massive thunderstorm in the afternoon. Want more cool ideas, hop onto the fanzine, it's free!